The 600 is a handheld Cable Height Meter instrument for measuring cable height distance, sag and overhead clearance. It is the present day alternative to measuring poles. The Suparule 600 uses ultrasonic signals to identify the height of overhead cables of up to 50 feet / 15 metres. 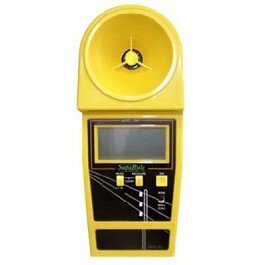 Ideal for operators in the utilities industry such as telecommunications and electricity, the CHM600E (Cable Height Meter) measures the height of up to 6 wires. If the height of only a single wire is needed we recommend the CHM190 model, or either the CHM300 or CHM300E for 3 wire height measuring. The CHM300 emits from the cone transmitter a short burst of sound. The instruments processor then calculates the time taken for the sound to be reflected from the cable back to the Suparule Cable Height Meter. The result is then shown in either imperial (feet and inches) or metric (meters) format on the user display. A sensor is mounted on the front of the instrument to measure the actual air temperature and compensate for the speed of sound which varies in different temperatures. To operate the Cable Height Meter simply stand beneath the cable and align longitudinally (looking down the cable line) and press the ‘ON’ button. This will power the instrument and allow the temperature to stabilise. The press ‘MEASURE’ and if required gently tilt the Suparule CHM until the result is shown on the display.